Youth Parliament Pakistan has published the study visit report. 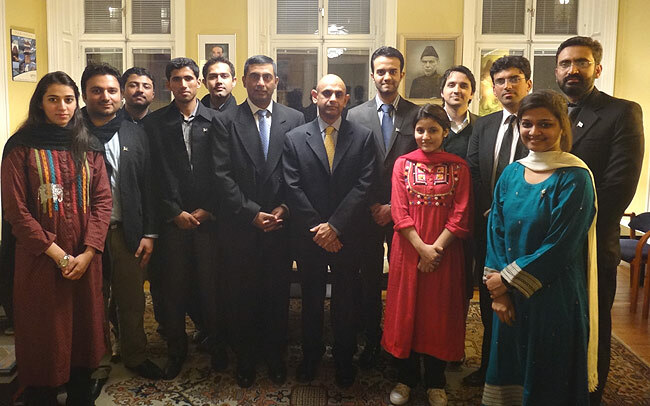 A delegation of Youth Parliamentarians from Pakistan visited Stockholm, the capital of Sweden for a 1-week Study Trip to meet Representatives from the Swedish Government, Political circles and the Civil Society. The Study Visit began on November 25 and concluded on December 01 (2012). The purpose of this Study Visit was to explore the initiative that the Sweden has taken over the years to strengthen the roots of democracy and Governance. For this, the 12 member delegation of the Youth Parliament visited the key and historic institutes in Stockholm which included Riksdagen, The Parliamentary Ombudsmen, Ministry of Foreign Affairs, Nobel Museum, National Audit Office, Municipality, Swedish Institute, Ministry of Education, Liberal Youth Party Office, Hammarby Sjöstad and National Council of Swedish Youth Organisations (LSU). Members of Youth Parliament Pakistan (2012) who were selected to be part of the delegation, based on a performance evaluation carried out by the Secretariat of Youth Parliament and the Youth Parliament Steering Committee, included Mr. Muhammad Hashim Azeem, (YP33-PUNJAB13); Youth Prime Minister; Ms. Sarah Abdul Wadood Khan, (YP19-KPK06); Deputy Speaker; Mr. Tabraiz Sadiq Marri, (YP58-SINDH10); Youth Leader of the Opposition; Mr. Muhammad Umar Riaz, (YP36-PUNJAB16); Youth Minister for Law, Parliamentary Affairs and Human Rights; Ms. Shaheera Jalil Albasit, (YP56-SINDH08); Youth Minister of Foreign Affairs and Defence; Mr. Muhammad Hammad Malik, (YP16-KPK03); General Secretary Green Party and Chairman Special Committee on Energy Crises; Ms. Seep Akhter Channer, (YP55-SINDH07); Member Youth Parliament Pakistan; Member of Youth Parliament Standing Committee on Law, Parliamentary Affairs and Human Rights; Mr. Siraj Din Memon, (YP57-SINDH09); Member Youth Parliament Pakistan; Member of Youth Parliament Standing Committee on Law, Parliamentary Affairs and Human Rights; Mr. Najeeb Abid Balouch, (YP05-BALOCHISTAN03); Chairperson of Youth Special Committee of Balochistan and Mr. Naveed Hassan, (YP41-PUNJAB21); Youth Shadow Minister for Information Technology and Telecommunication. Mr. Jawdat Bilal, Project Manager Youth Parliament Pakistan at PILDAT and Ms. Sana Shakeel, Assistant Projects Officer were part of the delegation. The Study Visit, facilitated by the Swedish Embassy, Islamabad and supported by the Swedish Institute (SI), Stockholm, underwent to provide an opportunity to selected Youth Parliament members to understand the Swedish political and Parliamentary system and engage in a meaningful dialogue with Swedish youth counterparts on issues of mutual interest and concern. The Youth Parliament Pakistan is a project conceived and implemented by PILDAT. Youth Parliament Pakistan 4th and 5th batches have the support of Danish International Development Agency, Government of Denmark in recognition of the importance of young people's involvement in democracy and democratic practices.